FortuneBuilders.com and their partner Memphis Invest had the incredible opportunity to donate $61,000 to St Jude Children’s Research Hospital during the weekend of May 12th, 2012. 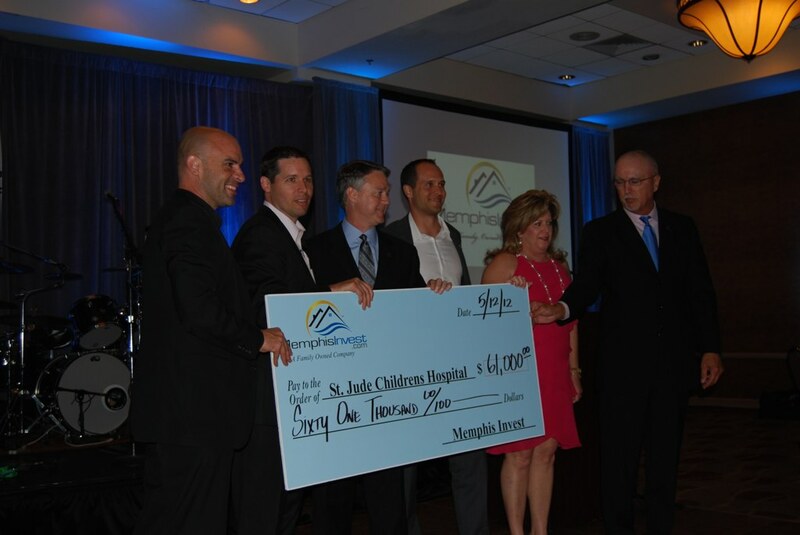 FortuneBuilders and their partner Memphis Invest had the incredible opportunity to donate $61,000 to St Jude Children’s Research Hospital during the weekend of May 12th, 2012. During their Semi-Annual Cash Flow Buying Event, FortuneBuilders and Memphis Invest were joined by over 110 Investors from 14 different states who flew into Memphis, TN to look at and invest in some of the premier Turnkey Rental Property Inventory in the entire country. 21 Cash Flow Rental Properties were picked up by individual FortuneBuilder’s Mastery Students over the weekend for their personal Real Estate Portfolios. The success of the event culminated on Saturday evening where FortuneBuilders and Memphis Invest hosted their Investors at a celebration gala. The Clothier Family who runs Memphis Invest and Paul Shively who represented FortuneBuilders, had the opportunity to present a check to St. Jude’s for $61,000. A $500 portion of every profit from home sales by Memphis Invest and FortuneBuilders this year was donated to this wonderful cause. An additional $23,000 will be donated upon closing of the property on behalf of the individual Investors who purchased houses that weekend. This effort helped to spearhead a new philanthropic initiative for FortuneBuilders in 2012. A major push for FortuneBuilders this year is to seek out and initiate solid relationships with major charities and philanthropic causes throughout the country.